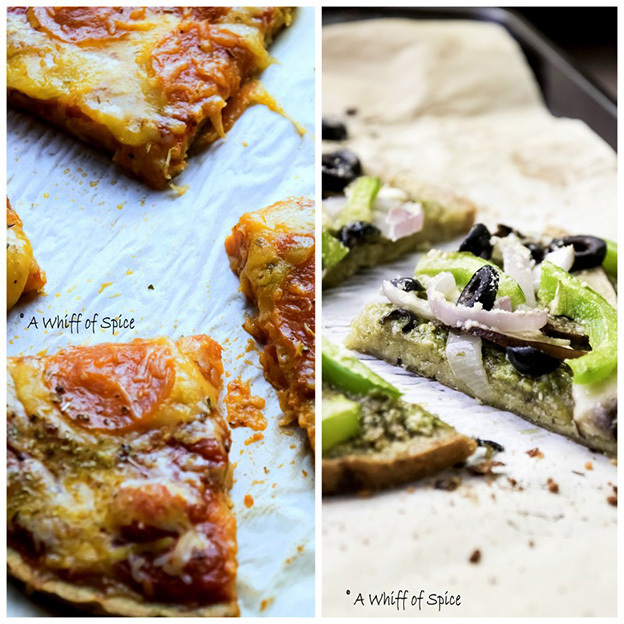 A Whiff of Spice: Quinoa Pizza Crust - Weeknight Pizza is a Reality now! 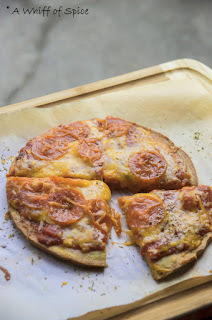 Homemade - From Scratch - Weeknight Pizza is a reality! Pizza has always one of those thing I have consciously shied away from. Not only its a long and tiring process to make it from scratch, but it is a "Carb Quicksand". What's a "Carb Quicksand", you ask? Well, it is something, where you take one innocent bite of your favorite comfort food (read: Simple Carbs) and before you know it, you are sliding down the rabbit hole into a bottomless pit of Carbohydrates, that will spike your Blood Sugar, giving you a false sense of well being. And mere moments later it will crash you so hard, you'll end up feeling really really lousy. This phenomenon, unfortunately, happens only to Diabetics, and it difficult for anybody else to even imagine how gross one feels at a time like this. Though not allergic to gluten, I have always felt lousy after eating a pizza. I am bloated and feel squeamish. I generally avoid it. That being said, who can ever resist the smell or the sight of a freshly baked pizza with oozing cheese. Every time I'm in a pizzeria, to pick up something for Sam or Sid, I have to muster every ounce of will power to stop myself from indulging in even one slice. Because, you never know when one slice can quickly turn into a Carb Quicksand! But not anymore. 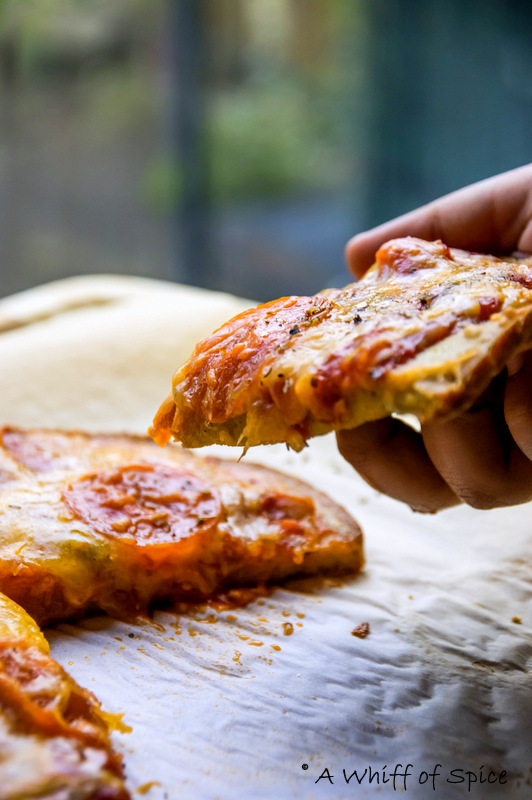 Now I can have my Pizza and eat it too, thanks to this wonderful recipe. The recipe is as simple as it can get. No kneading; no proofing the yeast; no waiting for the dough to rise. It is just Soak, Rinse, Blend and Bake! Yes! We are once again talking about the magically versatile Quinoa! All you need to do is soak the Quinoa for about 8 hours. Scrub it and rinse it to get rid of 'saponin', which coats the seed and is responsible for the bitter and soapy after taste. Blend the soaked and rinsed quinoa with little water, baking powder, salt and olive oil. Pour it in a cake pan and bake till golden and crispy at the edges. Slather your favorite sauce and toppings and shredded cheese... Don't forget the Cheese!!! Bite into a slice of Heaven! Do not let the long soak time deter you from making this easy peasy pizza. Just soak some quinoa while brewing your morning cuppa. 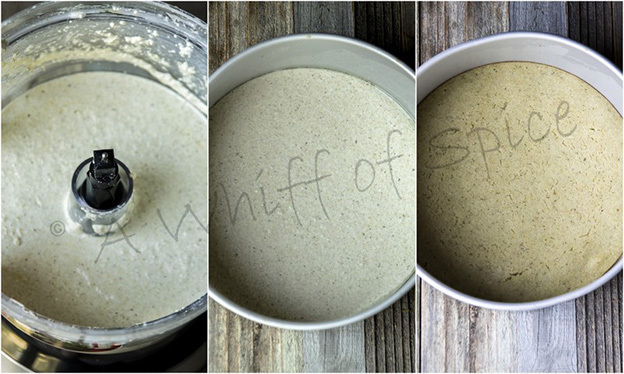 By the time it is dinner time, all you need is to Rinse, Blend and Bake! And while the crust is baking gather your sauce and toppings. Slather the crust with your favorite sauce (Pesto is a personal favorite). Arrange the veggies, meat, or herbs and sprinkle the cheese. Bake for few more minutes. 30 minutes from start to finish, your pizza dinner is ready! The quinoa crust, though gluten free, has a nice bread-y feel to it. It is hardy crust,which can stand up to heavy topping. So go ahead... unleash your Pizza fantasy!!! 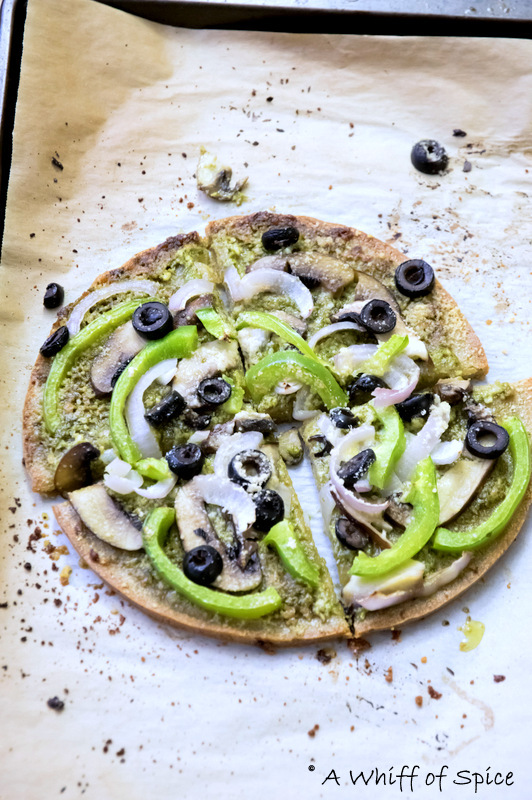 Recipe Snapshot: Quinoa Pizza Crust - Weeknight Pizza is a Reality now! 1. Give the raw, uncooked quinoa a good rinse. Easiest way is to take the quinoa in a fine mesh strainer and running water through it while scrubbing well for couple of minutes. This gets rid of 'saponin' which coats the seed and is responsible for the bitter and soapy after taste of quinoa. 2. Soak the rinsed quinoa in ample water, covering it by at least 1 inch, for at least 6 hrs to up to 8 to 10 hours. Rinse once again before using. 3. Preheat the oven to 425 F. Line a 9 inch cake pan with parchment paper and gently spay oil around the edges of the pan. 4. In a blender or food processor, add the soaked and rinsed Quinoa, Salt, Water, Baking Soda and Olive Oil. [You can add additional flavoring like garlic powder, dried oregano or basil or grates Parmesan to being more flavor to the crust]. Blend or process till the Quinoa is blended into a thick creamy batter. The batter should resemble a thick pancake batter. 5. Pour the batter in the prepared cake pan and bake for 15 minutes. Flip and bake for another 5 minutes. 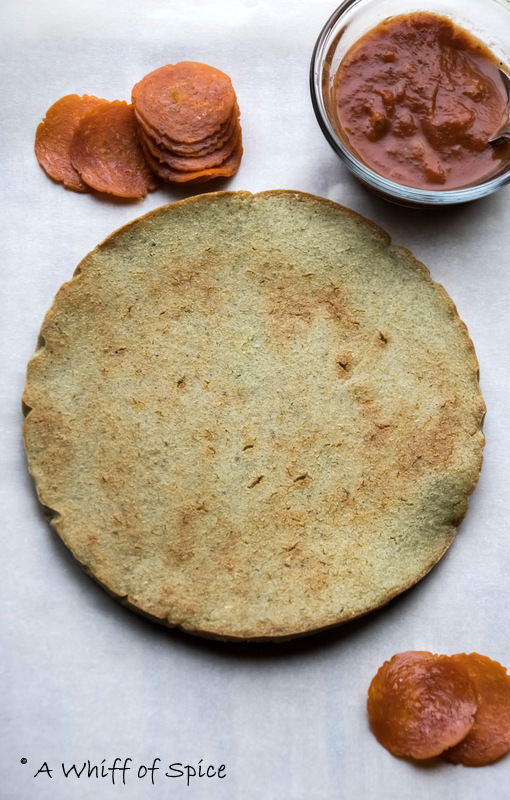 The pizza crust is ready for your favorite sauce and toppings. 6. I went with the classic combination of Tomato Sauce (Marinara) + Pepperoni + Cheese. Slather the sauce all over the crust. Add the Shredded Cheese (I used a Mexican blend, instead of Mozzarella). Arrange the pepperoni slices and bake for another 10 to 12 minutes till the cheese is bubbly. 7. Let the pizza cool for a little bit. Transfer it to a cutting board. Slice and enjoy with a smattering of more dried herbs like oregano or basil; or red chili flakes; and/or grated Parmesan. Notes/Tip: I actually made two pizza. In the first pizza, I added additional flavorings like Garlic Powder, Grated Parmesan and a mix of dried Oregano and Basil. I did the classic Tomato Sauce (Marinara) + Pepperoni + Cheese combination for that crust. For the other one, I left it plain. I did a Pesto + Red Onion + Black Olives + Mushroom + Bell Pepper combination. If your topping sauce is full on flavor, its best to leave the crust plain.